Choose one of the 6 best GoPro alternatives action cameras 2019 to save your budget. Find GoPro action camera too expensive and do not have enough budget to afford it? Don't worry, there are plenty of top action cameras in the market today, many of which feature much lower prices than GoPro. Here we list 6 best GoPro alternatives action cameras in 2019, which are more affordable than the pricey GoPro and you can consider buying. GoPro is an American leading digital camera manufacturing company founded in 2002 by Nick Woodman. It produces many high-end action cameras allowing users like cyclists and adventure enthusiasts to capture exceptional 4K/HD action videos/movies or even the hit 360 degree VR videos. GoPro also develops its mobile apps and video editing software. Its product lines mainly include GoPro Hero cameras like Hero 3 (2012), Hero3+ (2014), Hero 4 (2014), GoPro HERO+LCD (2015), GoPro HERO+(2015), Gopro HERO6 Black (2017), Gopro Fusion (2017), etc. Need to mention that GoPro also produces 360 degree VR video cameras, GoPro Fusion, allowing users to capture the whole scene and create professional-quality 360° panoramic videos. The last good alternative to GoPro action camera you can try is HTC Re. It packs in a 16 MP Sony CMOS camera sensor with a 146-degree ultra-wide angle lens allowing users to record 1080p FHD videos at 30fps and 4X slow-motion videos, time-lapse videos, etc. This action camera supports WiFi, Bluetooth 4.0, 5-pin microUSB, microSD slot (up to 128 GB card). Users can use Android and iOS telephone app to control it thanks to its WiFi and BLE connectivity. As for its battery, it equips a modest 820mAh battery offering 100 minutes of continuous video recording. Its waterproof construction lets you shoot up to 1 meter underwater. All in all, it's remarkably fun, incredibly easy, intuitive control. 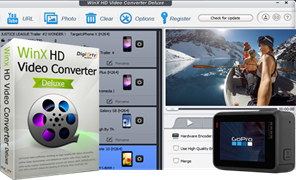 Best all-in-one GoPro video editing software, video converter and downloader allows users to edit any GoPro video/footage, and convert the video file to MP4, AVI, WMV, FLV, MOV, iPhone, iPad, Android and many more. Also help users to free download any 8K/4K/HD/SD or VR videos/movies from YouTube, Dailymotion, Facebook and 300+ video sites. Intel/Nvidia/AMD hardware acceleration are available to specifically deliver fastest and smoothest GoPro 4K HEVC, 4K H.264 or other large videos converting/compressing.